What is Mission of Mercy Pittsburgh? 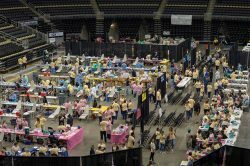 The signature program of a Call to Care, Inc., Mission of Mercy Pittsburgh, is a free, two-day dental clinic for under-served people living in Pittsburgh and the surrounding area, many of whom are from working families who do not have access to dental work or cannot afford dental insurance. ALL services are provided FREE of charge by local dental professionals, assisted by a host of volunteers. We will provide dentistry to hundreds of patients in the greater Pittsburgh area. This two-day clinic will utilize a team of dedicated volunteers, both clinical and non-clinical, to make this event happen. 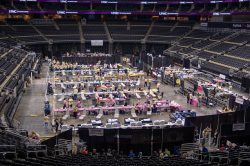 The 2019 event will be Friday, July 26th and Saturday, July 27th at PPG Paints Arena (doors open at 6:00 AM, clinic opens at 7:00 AM). Treatments offered will include: diagnosis by a dentist, minor restorative fillings, extractions, and cleanings. 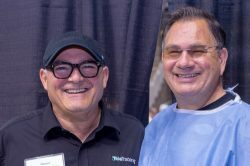 Additionally, we will connect patients to the agencies that are available for further treatment in our community and educate them on the importance of good oral health.